Eli was admitted to Ohio Bird Sanctuary on May 26, 2015. He was found on the ground at the Black Fork Bottoms Hunting Preserve in Ashland, Ohio with a severe wing injury and parasite infection. The injury required surgical amputation of the lower right wing in order to save his life. Unfortunately, the injury prevented Eli from being fit to release back to the wild. After several months of rehabilitation, he was transferred to RAPTOR Inc. on January 21, 2016. Eli has adjusted well to his new home. He is responsive to training and displays a calm demeanor. 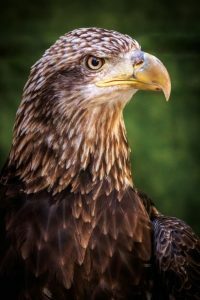 He will be on exhibit at RAPTOR Inc., serving as an avian ambassador for his wild counterparts and raising awareness of raptor conservation issues.